The biggest deforester this year in Southeast Asia has been the Malaysian company Bintulu Lumber Development (BLD), which cleared 1,702 ha of peat and 1,307 ha of peat forest on its plantation in Mukah division in Sarawak, Malaysia. BLD’s products appear in the supply chains of multiple traders and consumer goods companies, including AAK, ADM, Nestlé, Olam, IOI, Cargill, Louis Dreyfus Company, Lipsa and Reckitt Benckiser. 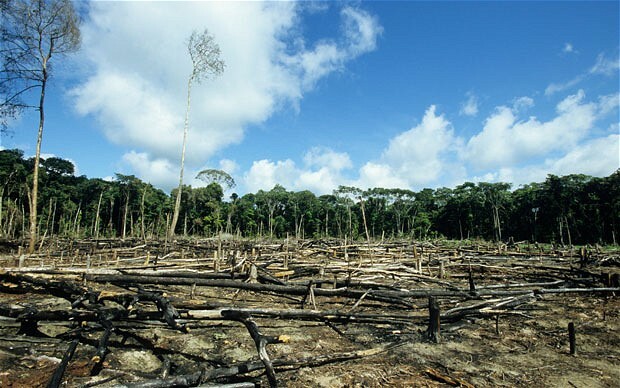 The second largest deforester includes companies owned by the Indonesian businessman Mr Sulaidy. PT Citra Palma Pertiwi 2 and PT Borneo Citra Palma Abadi are among his holdings. Both plantations are owned by PT Bangka Bumi Lestari (BBL), in which Sulaidy has 99 percent of total shares, according to notary acts. Almost 2,500 ha of forest has been cleared on these plantations in 2018. The nearest mill to both plantations is PT Ketapang Agro Lestari, owned by First Resources. It is unknown which companies are buying from Sulaidy’s plantations, since First Resources reportedly confirmed that it does not accept palm oil from BBL. The third biggest deforester of 2018 is the Bewani Oil Palm Plantation (BOPPL) in Vanimo, Papua New Guinea. Nine members of the Malaysian Tee family own the plantation. The Tee family, whose activity was highlighted in CRR’s report published on June 21, 2018 on shadow companies, has majority and minority ownership in groups of companies known as the Prosper Group, which includes the Bursa Malaysia-listed Far East Holdings Bhd. Members of the Tee family are the majority owners of four palm oil mills and the minority owners of another four mills. These mills contribute to the supply chains of many companies with NDPE policies, including Wilmar, Mewah, IOI, Musim Mas, Bunge, Sime Darby, ADM, AAK, Cargill, Colgate Palmolive, PepsiCo, Reckitt Benckiser, General Mills, Mondelez, P&G, Nestlé, Olam, Mars and Unilever. CAA Group, Citra Borneo Indah and Tunas Baru Lampung are three other notable deforesters. All three have recently been covered in CRR reports due to deforestation on their plantations or the methods they have used to publicly disassociate themselves from plantations linked to deforestation. As the reports highlight, these companies remain part of the supply chains of many businesses with NDPE policies. Jhonlin Group’s plantations segment belongs to mining businessman Haji Isam, known particularly for his coal businesses in South and Central Kalimantan. Sime Darby is the only known NDPE customer of Jhonlin Group. 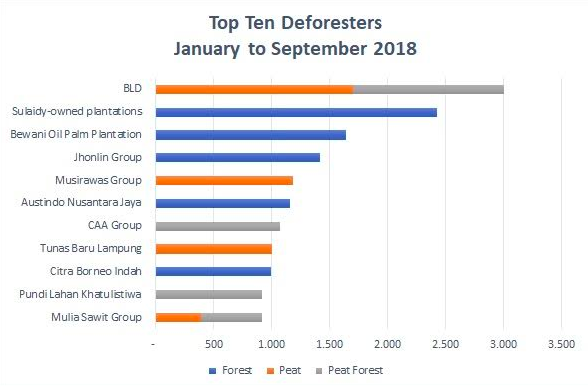 The Musirawas Group, the fifth largest deforester, supplies AAK, ADM, Apical, Fuji Oil, Louis Dreyfus Companies, Musim Mas, Olam, Sime Darby, Wilmar, General Mills, Mars, Mondelez, P&G, Pepsico, Reckitt Benckiser and Unilever. Austindo Nusantara Jaya, which has cleared over 1,000 hectares of potential HCS forest in Papua, has lost its customers in the NDPE market sector. As per Q2 2018, its main customer was PT Synergy Oil Nusantara (IFFCO Group). Punti Lahan Khatulistiwa, also on the list, purchased the PT Pinang Witmas Abadi concession from Triputra Agro Persada plantation in February 2018 and initiated land clearing soon after. The main customers for Triputra Agro Persada and Punti Lahan Khatulistiwa include Wilmar, ADM, IOI, Cargill, Colgate, Bunge, Mars, Olam, General Mills, Procter & Gamble, Unilever and Sime Darby. In September 2018, the Indonesian Environment and Forestry Ministry sealed off the plantation, effectively banning further development as a result of peat development and clearing of orangutan habitat. The main NDPE customers of Mulia Sawit Group, the company that rounds out the top 10, are Mars, Bunge, Cargill, Musim Mas, PZ Cussons and Pepsico. With deforestation persisting, increasing transparency about the main actors may prompt investors in the fast-moving consumer goods (FMCG) industry to take action to put pressure on companies to not source supply from those that produce unsustainable palm oil.